Described as Arizona’s most exquisite culinary event and certainly a best kept secret, get ready for an artfully crafted culinary experience at the Westin Kierland Resort and Spa. Set for this Thursday, the Friends of James Beard Benefit Dinner will feature seven of the nation’s best chefs serving a multi-course meal complete with carefully selected wine pairings from Barnett Vineyards. Guest will dine and enjoy a memorable evening of exquisite cuisine in the company of true culinary legends. During the Friends of James Beard Benefit Dinner, guest can participate in a silent auction with one-of-a-kind items provided by Vegas Valley Food Tours, Arizona Diamondback, Edible Destinations, Maison Roux, Westin New York at Times Square, The Camby Hotel, the opportunity to have dinner at the James Beard House, a $3,000 necklace by Isaac Jewelers and more. Individual tickets to the Friends of James Beard Benefit Dinner are $225, or purchase a table of 10 for $2100. This event takes place under the starry sky at the Westin Kierland Resort & Spa, 6902 E Greenway parkway, Scottsdale, AZ 85252. For more information, visit: www.scottsdalefestorg. Uni Aguachili Taco with Kampachi Salsa, Pork Chicharron Enfijolada with Hoja Santa-Serrano Pesto, Smoked Beef Tounge with Bone Marrow Butter and Ahí Tuna and Caviar Shooter with Dolce-Vanilla Sorbet. Reception wine: Etoile Rose. Born in Northern Mexico, Roberto Madrid brings a passion for Latino cooking to his role as chef de cuisine at deseo. Soon after opening, deseo was named among “America’s Best New Restaurants” by the James Beard Foundation and the accolades have continued. In addition to earning the Four Diamond Rating by AAA, the restaurant was recently voted “2014 Best Resort Restaurant” by Arizona Foothills magazine readers, was named as one of “America’s 100 Best Wine Restaurants 2013”, by Wine Enthusiast and recognized as “Best Latin/South American Restaurant 2013” by LocalEats. Leading the imaginative culinary experience at The Westin Kierland Resort & Spa is Executive Chef Chris Masco. From Italian to Southwestern, Mediterranean to Kosher cuisines, Masco’s over 20 years of experience with diverse culinary traditions bring a fine love and understanding of culture to the Resort’s culinary team. From his early achievements, Masco has brought his superior talent and dedication to his endeavors, earning such recognition as Best American Cuisine and a Mobile Four Star award. Chef Floyd Cardoz is a celebrated Indian-American chef in New York City and in Mumbai India. Cardoz partnered with Union Square Hospitality Group’s Danny Meyer to open Tabla, a beloved restaurant celebrating his groundbreaking “new Indian cuisine.” In 2011, Cardoz opened New York’s North End Grill, a seasonal American restaurant and bar, as partner and Executive Chef. In September 2014, Cardoz opened White Street Restaurant in New York’s Tribeca neighborhood. Born in Seattle, Washington, Michael Ginor is the co-founder and chef of Hudson Valley Foie Gras, the most comprehensive Foie Gras producer in the world. He was honored with the 1997 Angel Award from The James Beard Foundation for dedication, contribution and foresight. In 1998, Michael received the American Master Taster Award from the American Tasting Institute. Alon Shaya, Executive Chef and Partner of Domenica, Pizza Domenica and Shaya , discovered his passion for cooking at an early age, spending most of his time in the kitchen with his mother and grandmother in Philadelphia. Domenica has earned numerous accolades including being named a 2012 Top Restaurant by Food & Wine and one of Gayot’s hottest restaurants in 2014 as well as garnering attention in Bon Appetit, Food & Wine and Food52. Lenny Messina is the Chef de Cuisine at LOLA Restaurant, working alongside Executive Chef Michael Ginor. 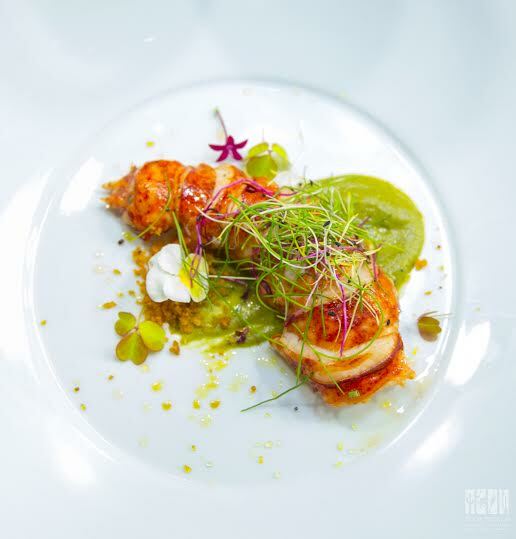 In 2015, the duo revamped LOLA with a brand new Pan-Mediterranean theme that caught the attention of local papers as well as the New York Times, who awarded LOLA with their most prestigious “excellent” rating. Since then, the restaurant has gained much local attention. It was named one of Long Island’s top 10 fine dining restaurants and received the 2015 Cutting Edge Award from the American Culinary Federation. A lot has happened in Celina Tio’s career since beginning her seven-year tenure at the American Restaurant in Kansas City, splashing on the scene with both local and national accolades. In 2005, Tio won Chef Magazine’s Chef of the Year title and then claimed the title of James Beard Foundation’s Best Chef: Midwest in 2007. Tio’s newest restaurant, The Belfry, is a neighborhood spot featuring craft beer, bourbon and chef driven bar food. It was honored as one of Draft Magazine picks for Best New Beer Restaurants in 2014. Limited tickets are still available through online purchase, for more information please visit: www.scottsdalefestorg. All net proceeds raised will support the non-profit Scottsdale League for the Arts in its effort to promote the arts and arts education organizations in the Phoenix metropolitan area, via annual fundraisers such as the Scottsdale Culinary Festival and The Friends of James Beard Benefit Dinner. Since 2002, the League has contributed more than $4 million to numerous organizations such as Ballet Arizona, Childsplay, and Free Arts of Arizona. The Scottsdale League for the Arts is a 501(c)(3), non-profit volunteer organization of accomplished men and women who support artists, arts programs and arts education through fundraising and special events. In order to offer continuous value and assistance to the arts, the League awards all net funds raised to a variety of arts focused organizations through a grants program. For more information, visit: http://leagueforthearts.org.